The Limerick Feminist Network is committed to fighting for full bodily autonomy for all people in Ireland and believe that there should be a repeal of the 8th amendment. We regularly hold information evenings and work with organisations that are pro-choice, pro-abortion and promote full reproductive and birth/maternity rights. 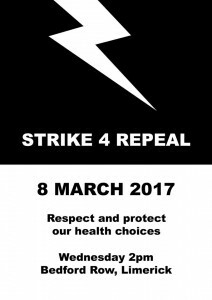 We are members of the Coalition to Repeal the Eighth Amendment and supporters of the Strike 4 Repeal movement. 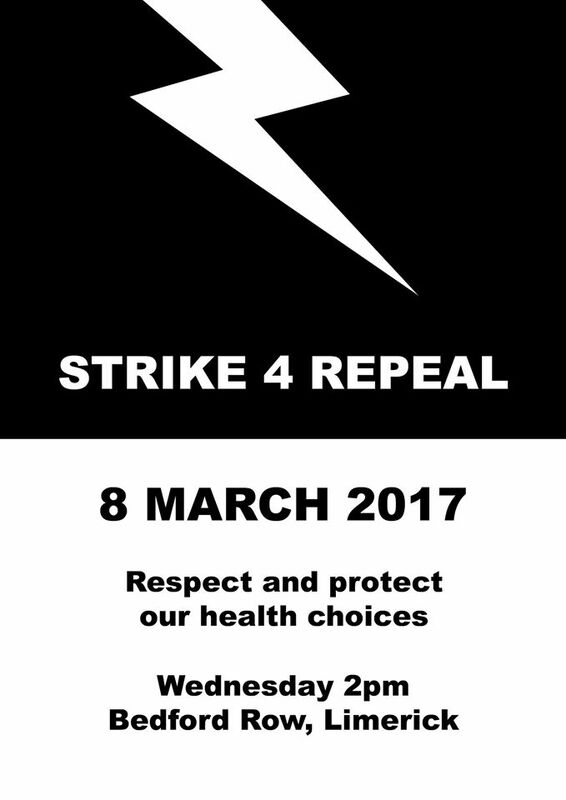 Strike 4 Repeal are an ad-hoc, non-affiliated group of activists, academics, artists and trade unionists preparing a nationwide Strike for Repeal on the 8th of March 2017. The demand is that the Irish government call a referendum to repeal the 8th Amendment by the 8th of March. If not, Ireland will strike. The strike will not be an industrial strike in the traditional sense but could include taking an annual leave day off work, refraining from domestic work for the day, wearing black in solidarity or staging a walkout during your lunch break. Business owners in a position to close their services at no cost to workers are also being encouraged to do so for all or part of the day as a solidarity action. You can read more about Strike 4 Repeal at: strike4repeal.org and find their press release here. If you would like to get involved in this event please contact Aims Ireland or Limerick Feminist Network for more details. To add yourself to the facebook event click here. To find information on the upcoming abortion referendum and all things Pro-Choice happening in Limerick click here. Click the link below to view our submission to the citizens assembly. For information and links to organisations that can help provide people with support, information and access to abortion and abortion pills click here. The Limerick Feminist Network has started to log of the best pharmacies to get the morning after pill in the Limerick area. To view this information click here. What is the Eighth Amendment? Article 40.3.3, known as the Eighth Amendment, was voted into the Irish Constitution by referendum in 1983. The amendment states: ‘The states acknowledges the right to life of the unborn and, with due regard to the equal right to life of the mother, guarantees in its laws to respect, and as far as practicable, by its laws to defend and vindicate that right.’ The amendment equates the life of pregnant people with that of an embryo or foetus and has created an unworkable distinction between a pregnant person’s life and their health.